Mill-Max is pleased to announce a new selection of insulated terminals. Six popular Mill-Max pins and receptacles have been fitted with cylindrical insulating sleeves for electrical isolation applications. The new offerings include three header pins, two receptacles and one solder cup pin to suit a variety of uses. Insulated terminals are used to electrically isolate single pin interconnects from surrounding conductive components or elements in an assembly. The plastic sleeve provides insulation of the terminal for such applications where the pin/receptacle must pass through a conductive housing without coming in contact with it or where a pin/receptacle, installed on a board, needs to be protected from nearby conductive components. The sleeve also facilitates the handling of small, individual terminals and can provide mechanical support for pins mounted on or through printed circuit boards. These discrete insulated pins and receptacles offer a dedicated single position insulated terminal, circular in shape, making them perfectly compatible with drilled holes in boards or assembly housings. 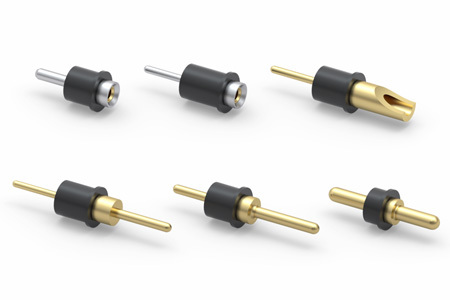 They are an alternative to one position standard connectors which have square insulators. The high temperature, glass filled nylon 46 insulators are suitable for most soldering processes. The pins and receptacle shells are precision-machined components; the receptacles are fitted with high reliability stamped beryllium copper contacts. If this selection of insulated terminals does not fit your requirements exactly, contact out technical services department to discuss your needs. There are other standard pins and receptacles which these sleeves will fit or a quick turn custom solution can be explored.